In Pic Saint Loup since 1254. 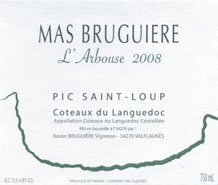 Mas Bruguière is a long-established vineyard, highly typical of the Pic Saint Loup appellation. 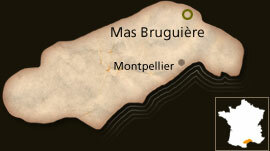 It is situated at the foot of the mountain with some wonderful terroirs. Xavier, seventh in a line of Bruguière winemakers, took over the estate where his father left off. Organic and biodynamic methods, controlled yields, vinification and ageing are all carried out with meticulous care. This, together with the avoidance of chemicals, strict use of naturally-occurring yeasts and as little sulphites as possible, gives the wines a freshness and minerality typifying all that is best in Pic Saint Loup. Vinification is constantly evolving, and wine – with its increasingly fresh and silky tannins – bears witness to this. 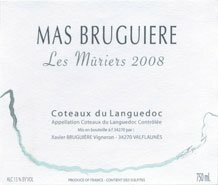 At Mas Bruguière, pigeage is manual and occurs twice daily to extract the tannins and color. Gravity steeping prevents any stress to the wine. In this gorgeous Pic Saint Loup setting, a simple yet attractive building houses a veritable treasure of stately casks and barrels of French oak, which shape and transcend the wine. The surroundings invite visitors to meditate. 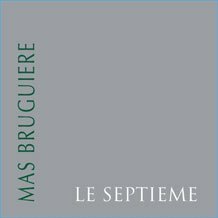 The Mas Bruguière wines displays great consistency, uniform quality, and a composition that is as aromatic as it is structural, with silky and smooth tannins. The wine has evolved beautifully over time and has held its freshness impressively. On 20 ha of vines, six ha of young vines are preparing the way for new vintages to be discovered. This vintage is made from a blend of 80% Roussane and 20% Marsanne and is straw-colored with shades of gold. Its nose is very delicate with mineral overtones from the vineyards between Valfaunès and Lauret, where late ripening and strong minerality contribute subtlety and freshness. The aromas of ripe fruit from grapes grown within the estate combine with a certain hoppiness and the well integrated and delicate toasted notes provided by aging in demi-muid barrels. Fruit flavors include Mirabelle plums and white peaches, with fine vanilla overtones and hints of ripe tannins, providing volume and length, while whetting the appetite. The resulting harmonies provide a long-lasting aftertaste, extended by the wine’s natural freshness. Drink at one to seven years old. Its balance of maturity, freshness and volume mean this wine can be served with distinctively flavored dishes. When enjoyed young at around 10-11°C (50-52°F), it is the ideal accompaniment for spelt risotto with girolle mushrooms, fillet of seabass with buttered cabbage, cod steak on a bed of leeks. After a few years’ bottle age, it can be served at 12-13°C (53-55°F) with pan-fried foie gras and pain d’épices, roasted veal chop, sweated fennel, French toast with acacia honey. Grape Varieties: 80% Roussane, 20% Marsanne Terroir du Pic Saint Loup: Clay-limestone soil and stony red clay. Yields: 45 Hl / Ha Vinification: Direct pressure, lees stirred, fermentation in temperature-controlled vats. Naturally-occurring yeast and low sulphiting. Aging: For 80%, 10 months heat-regulated on fine lees. For 20%, 10 months in demi-muid barrels made from French oak. Made from a blend of 60% Syrah and 40% Grenache, this wine is a fairly intense dark, red color, which, due to its youth, shows myriad glints of blue and purple. While it is made for immediate drinking, it perfectly expresses the Pic St. Loup terroir. It has a very open and highly aromatic nose that is reminiscent of fresh, black fruit — blackberries, blackcurrants and bilberries — with fine, smoky elements. 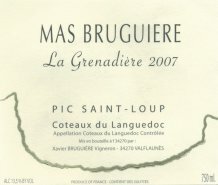 This wine was introduced to celebrate the seventh generation of the Bruguière family overseeing the estate and is mainly made from Mourvèdre, which gives it a very intense deep red/purple color. The nose, which is delicate when young, opens to display a range of black fruit aromas with hints of undergrowth. Twenty-four months of aging provide roundness and well-balanced volume. The ripe tannins, combined with a lovely freshness on the palate, make this a beautifully silky wine. The force of this wine is very well integrated and altogether charming. This pleasurable wine shows just how far the estate can push back the boundaries when dealing with a difficult grape that requires special attention, making the other vintages at least appear far easier to manage. Serve at between 16-18 C (61-64 F), ready for drinking in three to 15 years’ time. Perfect with autumn food: Rib of beef with cèpe mushrooms, knuckle joint of lamb, garlic confit and oyster mushrooms, pavè de taureau (beef steak) with girolle mushrooms, wild boar stew, hare à la royale. The wine is unfiltered and may contain a small amount of sediment, which does not affect the quality. Soft limestone rocks at the foot of the slope. South-facing. Grapes picked by hand, then sorted and destemmed. Frequent pigeages to encourage gentle extraction, alternated with remontages (pumping over). Naturally occurring yeast and low sulphiting. Twenty-four months in French oak demi-muid barrels. A blend of 70%, Syrah, 15% Grenache and 15% Mourvèdre, la Grenadière is a highly intense, deep red with purple tones. Made with grapes from the estate’s oldest and finest vineyards, located in and around land that has been in the family since the French Revolution, this wine is the result of unrelenting hard work and the qualities of its exceptional terroir. Its nose is intense and complex, with very ripe, black fruit notes and hints of good structure, density and depth, with the remarkable freshness of wines from this unusually cool location at the foot of Pic St Loup. Grapes here are slow to ripen, leading to a balance between density, powerful tannins and intense fruit flavors. Its tannins, which are perfectly ripe and well integrated due to 18 months’ barrel ageing, provide terrific, harmonious length, with great ageing potential. Best enjoyed between 3 and 15 years old. Decant and serve at 16-18C (61-64F). Ideal with: Fillet of Venison in a Grand Veneur sauce, Wild Boar Casserole, Slow-cooked leg of lamb, Duck shepherd’s pie, Pieds paquets with green Puy lentils, Roast fillet of beef with ratte potatoes. The wine is unfiltered and may contain a small amount of sediment, which does not affect the quality. Grenache and Mourvèdre: soft limestone rocks at the foot of the slope. Syrah: clay marl soil. Grapes destemmed, wine transfer by gravity, juice extracted gently through pigeages. Naturally occurring yeast and low sulphiting. 18 months in French oak 50% in demi-muid barrels, 50% in 30 HL frusto-conical wooden vats.